Phone 1-800-514-0301. Businesses can talk with ADA specialists to obtain answers to specific ADA questions during business hours or can order ADA publications in print and alternate formats 24 hours a day. Text of the Americans with Disabilities Act. 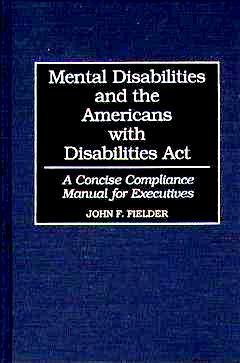 A clear, practical compliance guide to ADA, written by a psychologist, to help organizations conform to provisions on mental illnesses in the Americans with Disabilities Act. Under the Americans with Disabilities Act, organizations that fail to provide reasonable accommodations to employees with mental disabilities may be subject to penalties and punitive damages. The Act does not, however, provide useful guidelines to help organizations comply–a gap that Dr. Fielder’s book now fills. This manual shows that compliance is not difficult or expensive. In clear, concise language, it acquaints management with mental diagnoses, impairments, disabilities, the myths of mental illness and its affect on job performance, and provides samples of workplace accommodations and compliance plans. Practical and readable, the book is intended for management of organizations with 15 or more employees, their human resource staffs and employee assistance professionals, and legal counsel. 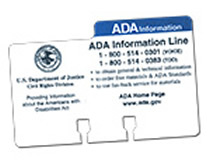 It is important legally and as responsible citizens to understand the provisions of the ADA and how they apply to persons with a mental illness. The ADA is a law that was passed by Congress in June 1990. Under this legislation, employers must provide “reasonable accommodation” to an individual’s disability in the workplace. Having more time to learn new job tasks. Knowing that your job would be protected in the event of a rehospitalization. Being able to work in a quieter room during periods of high stress when you are experiencing symptoms. Having a job coach on site to help you during periods of difficulty. Flexible scheduling of work hours. Rearranging job tasks or sharing job duties with co-workers.